This is an Anthophyllite from New Jersey. The pale yellow color here with darkfield dispersion staining indicates a refractive index match in this 1.605 high dispersion liquid at a wavelength of about 450 nanometers. That indicates a D-line refractive index of about 1.622 for this fiber. Anthophyllite asbestos is a fibrous amphibole with the chemical composition (Mg, Fe)7[Si8O22](OH, F)2. It is one of the more hazardous forms of asbestos. Anthophyllite had a rather limited commercial use and is encountered as an impurity in talc as often as it is as an intentionally added material. In materials with a significant talc content the amount of Anthophyllite can exceed 1%. 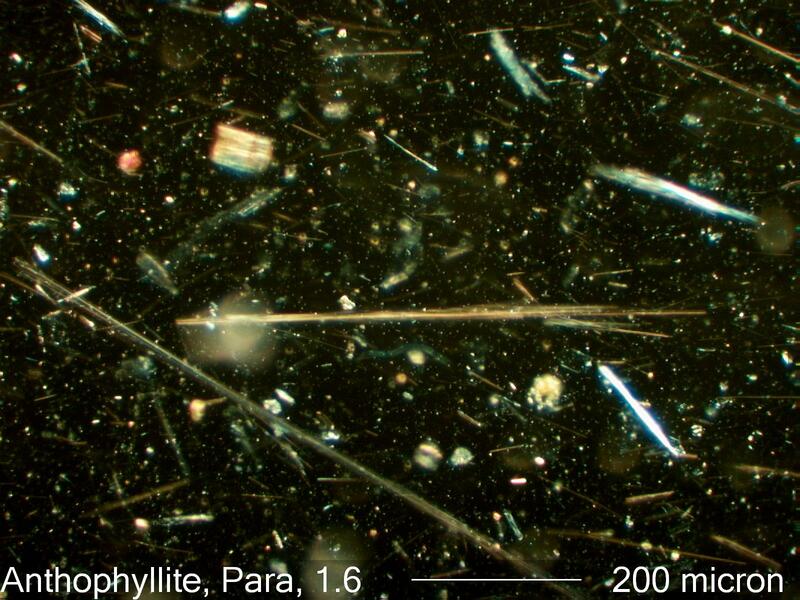 Anthophyllite has refractive indices that overlap those of Tremolite and Actinolite asbestos but Anthophyllite always shows parallel extinction. As an impurity it is generally found with high concentrations of talc. It was used as an additive in paint and ceramics, mastics, floor tiles, acoustic tiles, and other construction materials.